This is a 4.2 oz, 2.7” by 1.7” by 1.6” cluster from Inner Mongolia (China) that is truly unusual and astounding! 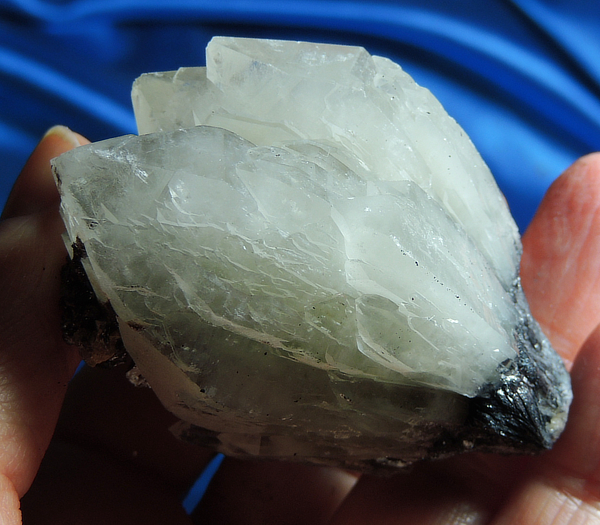 She is a spectacular cluster of lightbrary crystals, all greenish-gray, and included with glitter-like specular hematite that gives her that distinctive color … and she is an artichoke quartz! The term, artichoke, describes the growth habit of the quartz that is somewhere between a prasem quartz, a tessin quartz, a lovestar quartz and a lightbrary and with characteristics of each. What is truly amazing is that she is actually a cluster of smaller clusters, so she has a lobed look with keys all around her edges. Check her with a loupe to fully enjoy all her intricacies – she is nothing short of amazing and a meditation just to explore.